As part of this development track you will work on different electronics tutorials, putting together different circuits using the Raspberry Pi and writing code in MicroPython. We will be using Edublocks to put the code together. EduBlocks is a visual block based programming tool that is designed to help introduce text based programming languages, like Python, to folks who are comfortable with block based programming languages and considering moving to a text based programming language. Through these tutorials your child will explore fundamental coding techniques and strengthen their reasoning, problem solving and analytical skills. As you progress through these tutorials with your child, they will learn how to interact with Python and Edublocks, they will learn how to work with different electronics components, they will learn to put together different types of electronic circuits and more importantly they will learn how to create smart electronics circuits using the MicroPython programming language (through Edublocks) on the Raspberry Pi. This development track is aimed to serve as a bridge for those working with block based programming languages and keen to move to lower level text based programming languages. EduBlocks is a visual block based programming tool that is designed to help introduce text based programming languages, like Python, to children at an earlier age. With Edublocks, kids can start familiarizing themselves with text based programming language patterns, structure, requirements using a block based approach. Edublocks support development on the following platforms. Python – EduBlocks Pi features a range of Basic Python functions to get you started with how the basics of Python work. GPIOZero – GPIOZero written by Ben Nuttall and Dave Jones is the most common library for controlling the Pi’s GPIO pins. You can use it to spin motors, control LEDs and much more! Minecraft – The Raspberry Pi features Minecraft Pi Edition as standard, EduBlocks includes the Python library that allows you to hack Minecraft! SonicPi – Sonic Pi, written by Sam Aaron, allows you to make music with code. The unoffical Python library for Sonic Pi is included in EduBlocks. PiMoroni Addons – Control the BLINKT! LED stip and the Explorer hat with the official libraries included in EduBlocks. 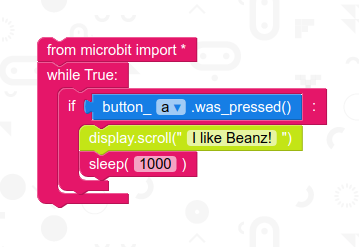 BitIO – BitIO, written by David Whale of the micro:bit foundation, allows you to control the micro:bit via Python 3 using serial commands. Block Format: Easy and simple interface that uses a building block format to code. Extensive Documentation: Lots of documentation to get you ready to go quickly. New projects added every 2 weeks. Range of libraries: EduBlocks has a range of libraies like GPIOzero, Minecraft & Sonic Pi. Python View: Once you have coded the blocks, you can easily switch to the Python View to see the real Python code.